Schlurfs, no, not little blue gnomes but young people in Austria who rejected what the Nazis had to “offer” – the whole package of militarism, the work ethic, authoritarianism and race hatred. The typesetter Fredy Pietsch described some Schlurfs in his reminiscences: “When we walked in there we saw a few Viennese men in the group, whom we called ‘Wiener Schlurf’... ‘Wiener Schlurfs’ wore their hair in a certain style very high in front, long hair, very high in front, to make the so called ‘Lahmwelle [in Viennese dialect] and at the neck, the ‘swallow tail’. The long hair was put on top of the other part, and greasy brilliantine was rubbed into the whole thing, so that the hair would keep shape. And there were about 5, 6, 7 of these so-called ‘Schlurfs’ with this hairstyle with us. The origin of the word “Schlurf” can be traced back to the spoken word Schluaf , an old Viennese put down of boys and men who prefer fun to responsibility. The written word Schlurfe was used in official public documents for the first time in 1941. As early as the 1930s, there were apprentices, young auxiliary workers and schoolboys who showed a preference for the sharp clothes which could be seen in the new Hollywood movies, for a particular hair cut, for swing music and swing dance. All of these later became trade-marks of the Schlurfs, as they did with the Zazous in France. Young people who strived for this look used different means to look sharp, depending on their social background or moral outlook. Some might save for a long time to buy a sharp coat or shirt, whist others would be able to procure a stolen suit, whilst others had to alter their older brother’s clothes. Old hats were moulded to the desired shape by applying steam. Large single-breasted suits were converted to double-breasted versions by adding additional buttons. 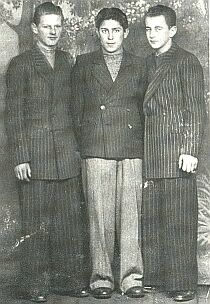 Plaid and pinstripe were the preferred patterns. White scarves were worn, as were thick-soled shoes. Furled umbrellas, much loved by the French Zazous, were not used by the Schlurfs and frowned upon, probably because they were soon as being too bourgeois! Schlurf women or ‘Schlurf kittens’ wore coloured dresses with knee length hem lines and sported upswept hair. In 1941, the Nazis began to implement their social and cultural policies in Austria. This meant they had to pinpoint a group which would be the opposite of what they desired and to then persecute that group. The Schlurfs were defined as “immature youngsters whose way of being is deficient and who strive for superficial leisure, dance, jazz music and women”. This artificially created group combined a number of different practices or ways of behaving, seen as undesirable by the Nazis, into a unity. Whereas only one or two of these characteristics might be seen in the way of life of particular individuals, the Nazis combined all of these into a united uniform whole. All of these tastes involved fun, something that was anathema to the Nazis. So now the Nazis could use the artificial construct of the Schlurfs to develop their official policies . In fact they started a “campaign against the Schlurf menace”. As a result some young people began to actually identify with this “bad” role as defined by the Nazis. They accepted the definition and reclaimed it as their own developing it on the streets, in cafes and through their dress and social activities-dances, gatherings in flats, but also in their street opposition to the Hitler Youth, their slang and nick names, and their use of the black market to dress in their preferred style. “BdM (Nazi organisation for young women) and HJ (Hitler Youth) watch out for your lives. When the Schlurfs wake at night and come out of the Zweites café. They will swing their knives and St. Louis Blue will sing his songs again. Police, Filth, stop shaving our heads bald” – Schlurf song recorded in a Nazi archive. The Schlurfs began congregating at weekends at the bar-restaurant-cafe the Zweites Kaffee in the Prater district of Vienna, where they drank, smoked, and listened to live music (practices that were forbidden for young people under the Nazi regime). As noted earlier they were predominantly working class, and they began to attract many apprentices and young armaments workers to their ranks, as well as “misfits”; those rejected by the draft because of disabilities. Above all, there were the weekends in the Zweites Kaffee, at least as long as it was not raided. In this bar-restaurant-café located in the Prater, the largest entertainment area of the city, the youngsters could dance to live music, drink and smoke even though at times it was forbidden. The Schlurfs were predominantly working class, but class did not matter to them, those most respected were they who could look the sharpest and be the most laid back. In the Prater district itself street clashes broke out between the Schlurfs and the Hitler Youth. It was compulsory for young people to attend Hitler Youth meetings but they subverted this through absenteeism or open mockery. Concerts of Nazi ‘folk’ music were disrupted by the Schlurfs. Planned attacks on Hitler Youth units took place, with the response of police raids and Hitler Youth attacks. In November 1941 the Gestapo arrested 3 Schlurfs who were destroying an HJ poster which depicted caricatures of young men and women drinking, smoking, dancing and generally having fun, which had the slogan ‘We Reject These’ above it. On one occasion in 1942 50 Schlurfs attacked a HJ house. As with the Vichy youth organisation attacks on the Zazous in France, where Zazous had their hair forcibly shaved, so too did the HJ forcibly shave Schlurf scalps. The Schlurfs replied with attacks on the HJ, ripping and shredding their uniforms. The police tried to plant spies and the Schlurfs responded with the daubing of pro-Schlurf slogans on walls. The Nazis wanted to educate the youth in a “Völkisch” manner, that is, their concept of what a good German should be. This combined indoctrination in the school with indoctrination in the family to produce a youth with “Charakter”. One of the instruments used to impose this upon Austrian youth was by means of the HJ. However, the more there was a fightback against these impositions, the more the Nazis turned to stricter policies, the more the youth fought back, leading to the final collapse of these social policies in 1944. The Nazis tried to eliminate the pleasure principle from everyday life. For them the concepts of “duty”, discipline and efficiency were in direct opposition to the search for variety and fun in order to chase away boredom and monotony. The Nazis saw the slack behaviour of young workers as a threat to the imposition of their social and cultural policies. The Schlurf phenomenon, as with the French Zazous and the German Edelweiss Pirates, was a herald of the counter-cultures that were to develop in the post-war period, not just in Western Europe but around the world, counter-cultures that implicitly challenged the old order and its discipline and work ethic. The word “Schlurf” was used as an insult for several years after the end of the war against young workers who refused work discipline and authority, a sign that this kind of behaviour was as unacceptable to the new “Free World” as it was to the Nazis. The newspapers of the new Austrian democracy denounced the ‘weed’ of the Schlurfs that threatened the healthy tree of Austrian democracy. It appears that the police continued their repression against the Schlurfs. The word “Schlurf” was used as an insult for several years after the end of the war against young workers who refused work discipline and authority, a sign that this kind of behaviour was as unacceptable to the new “Free World” as it was to the Nazis. Thank You..A really interesting article. I wondered what those kids who didnt conform did. very brave. Did any of them leave memoirs? There's a futher similarity to Zoot Suiters in the US--Black & Latino youth making a bold statement & paying a price. For them it was to be accused of Fascist sympathies. Anyone interested should check out the movie "Zoot Suit" made around 1980. There was a spontaneous youth culture centered around Jazz Music developing in the late 'Thirties that was derailed by WW2--for a time at least. Yes, there will be a forthcoming article on the Zoot Suiters in the next issue of Organise! magazine of the Anarchist Federation. I followed Entdinglichung’s link and found it very interesting, however I have read some stuff which appears to contradict some of the details in their history of German swing music. The set also includes recorded swing music from the occupied territories. Ernst van’t Hoff ran a Dutch big band. Perhaps the 'Swing Youth' disliked this ‘imitation’ swing music and preferred the American ‘real McCoy’. EDIT: Visser thinks the audience disliked the Gestapo's objections. This is more of a footnote on the Nazis and swing. In 1938 the terrific black American trumpeter, Valaida Snow, was in Vienna on tour. Her band included on piano, Gun Finlay (aka Gunther Freundlich), a German-Jewish refugee and on bass a Spanish African, Louis Barreiro. Valaida played on in Europe (where she could get work) and managed to escape from Scandinavia on 28 May, 1942 and get back to the USA.